(May 15, 2003) -- Candidates in the June 10 special election for LB School Board (southern ELB, Signal Hill & Catalina) took their near final shots...in Signal Hill. 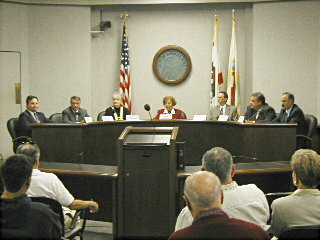 The candidate forum, sponsored by the Signal Hill Chamber of Commerce and held on May 15 in the Signal Hill City Council Chamber, allowed candidates opening statements, questions via a moderator, followed by a one minute closing statement. ...I look forward very much to being your advocate. I promise you I'll be accessible...I'm not a teacher, I'm not an educator, I've never been in administration of the school district. I will also tell you that means I'm not part of the problem. I'll bring a fresh view to the Board of Education and be a part of the solution. And if Andy doesn't want your vote, I do. [laughter] I will tell you, I'm in the same boat that you are. I also have to cast a vote for the school district that we're in. And I will tell you, these are the three things I am looking for. I'm looking for a candidate who has a vested interest. I'm looking for a candidate who has proven expertise. I'm looking for a candidate I can trust, not just because he says "trust me" but because he's got a voting record. ...First off, a statement was earlier that our teachers are part of the problem in the Long Beach Unified School District. Please know that that is not the case. They are our unsung heroes. I ask any of you to visit a classroom at any time in the Long Beach Unified School District and you will find hard working, dedicated, committed individuals who are not part of our problem in Long Beach. ...I want to bring my experience of teaching students and working with parents to the School Board. As a proven educator and as a concerned parent, I believe it is very important that you have a representative on a school board that will be the voice of our students and not the district bureaucracy.